Due to their size and relative autonomy, universities are like small cities, and like any city, they have a significant environmental footprint. They control large and permanent areas of land and inventories of buildings and are among the top employers in many cities. As such, they are major commuter destinations. If we compare the attributes of complete, walkable neighborhoods to many university campuses, they typically fail by basic metrics. In complete communities, people can: live throughout their lives, work, access a range of services, and enjoy social, cultural, educational, and recreational pursuits. Most campuses are exceptionally job-heavy but have limited residents on or near campus. On-campus housing typically includes some student dormitories, and sometimes student family housing, but staff and faculty and many students typically have to commute to campus. In terms of providing day-to-day services that everyone, including workers and students need, again they fail. Students living on campus and daytime workers often have to travel off campus for basic services and entertainment. Town and Gown developments, or residential communities on or adjacent to campus, can help to make the university more complete as a community by adding a greater diversity of residents, as well as services and entertainment for the whole campus population. The objectives of such developments are often threefold: 1) to raise revenue to support the university enterprise, 2) to attract permanent residents to campus and thus reduce commute trips, and 3) bring services and night life to campus, thus adding more completeness and vitality. 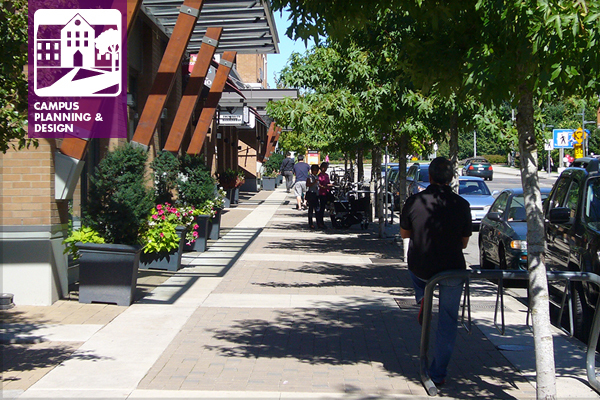 Wesbrook Place is one such neighborhood, located adjacent to the University of British Columbia’s main campus. Wesbrook Place was intentionally designed to be a compact, complete, and walkable neighborhood. The design is also intended to strengthen the University’s identity and to improve the overall campus vitality. The first plan was adopted in 2005 and the first residents moved in by 2008. At build-out, it is projected to house 12,000 people on a 45-hectare site, and as of 2014 it was 25% complete, with an estimated population of 3,100 residents. Wesbrook Place has been called “village in the woods” due to its location adjacent to a large, forested regional park, Pacific Spirit Regional Park (PSRP), and its partial enclosure by a forest buffer. A mixed use village center area is located at the northern edge of the neighborhood adjacent to a road which forms the border between the academic campus and the neighborhood. This village center includes a full service grocery store with a pharmacy, a range of personal and commercial services, plus cafes, food services, and a pub. A high school and community center are located adjacent to the village center. Daycare is provided in the community center and on the UBC campus for faculty, staff and students, while the elementary school is adjacent to campus, about 1.5 kilometers north of the site. The neighborhood is subdivided into residential blocks by a fine network of vehicular and “green” pedestrian streets. Vehicular streets are narrow and pedestrian-friendly. This green network interconnects all five parks and allows people to travel throughout the neighborhood off-street. The green streets also connect with the Pacific Spirit Park trail network. UBC has a goal that 50% of residents will be UBC students, staff, and faculty, thus the neighborhood design is family-friendly. A significant range of housing types and tenures, including townhouses, walk-up apartments, and tower apartments, is intended to attract a diversity of people, both UBC affiliated and not. Because market rate for-sale housing in Vancouver is out of reach for many middle income households, there is no singly family detached housing, and there is a significant amount of rental housing (20%), including some set aside for staff and faculty. With 30% of the site area in public open space, the development is exceptionally well served with parks and green spaces. Four parks with playgrounds, a sports field, and the green streets contribute to the interconnected green network. 10% of site area is a preserved forest buffer along three sides of the development. The adjacent Pacific Spirit Regional Park, at 763 hectares, has almost 75 kilometers of hiking, biking, and equestrian trails. UBC Farm, which produces and sells organic produce, sits along the western border of the development. Map: Five-minute (light blue) and ten-minute (dark blue) walking distances from the village center. Photo: A sidewalk along Wesbrook Mall. This is clearly a very walkable neighborhood—at build-out, about 1/3 of residents will be within a five minute walk of local services, while 100% will be in a ten minute walk. Everyone will be within a five minute walk of greenspace, parks, and a playground. Transit service is also excellent, with express buses to UBC running on 5 minute intervals during peak times and three bus routes serving the neighborhood. Designers employed a non-conventional stormwater system to manage the amount of runoff, thus avoiding damage to downstream waterways. A surface system is made up of a series of open channels, which collect rainwater from roofs and landscape areas and direct it into rainwater collection ponds. Water in this system is re-circulated. A more conventional piped system collects rainwater from roads and parking areas and directs it to a detention tank, then on to outfalls. Done well, Town and Gown developments can help universities to achieve their sustainability goals and concurrently improve overall campus livability. 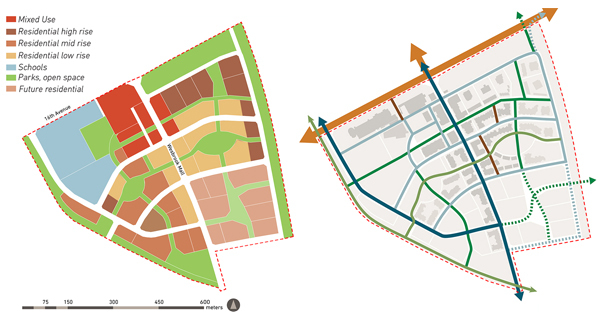 Wesbrook Place, as one example, performs very well relative to measures of population diversity, land use mix, density, walkability, and access to parks and services and to good transit services. Importantly, they make the campus itself a more complete community. Students and all residents no longer have to travel off-site for food, necessities, services, banks, pubs, and restaurants. Assuming 50% of the population will study or work on campus, they help to reduce vehicle commuter trips. Concurrently, they can significantly contribute to the financial sustainability of the university. In the case of UBC, the goal is to add over two billion dollars to the university’s endowment funds through developing this and several smaller neighborhoods. Site planning and public realm design by Perry + Associates, Vancouver, Canada. Wesbrook Place Neighbourhood Plan developed by UBC Campus + Community Planning, 2011. Purchase the full post-occupancy study from lulu.com.